Manufacturing Engineering Honours student Nigel Curran tells his story about the interesting trip to Hamburg, Germany in February 2018. He organised this trip together with Ross Breathnach for 42 students as part of the Engineering Society. Hi. My name is Nigel Curran and I am studying BSc (Hons) in Manufacturing Engineering Yr. 4. In Waterford Institute of Technology (WIT). 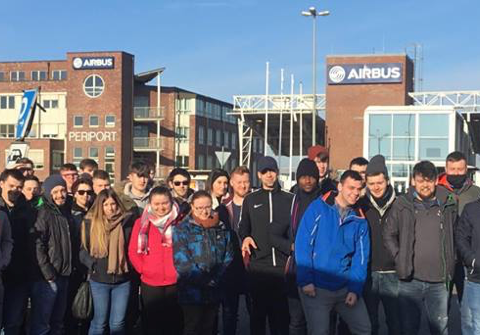 As part of the Engineering Society, Ross Breathnach and I organised a college trip for 42 students to Hamburg, Germany to visit Airbus. This included students from 1st – 4th year from the Mechanical and Manufacturing Engineering courses in the School of Engineering. We were joined for part of the trip by some of our lecturers; Paul Allen, Ned Cullinan Mary Doyle-Kent, Liam O’Shea and Lorraine Roche. The trip took place on Monday 5th – Thursday 8th of February 2018. We picked Airbus to visit because it is an international pioneer in the aerospace industry. They are a leader in designing, manufacturing and delivering aerospace products, services and solutions to customers on a global scale. The Airbus plant Hamburg-Finkenwerder is located on the south bank of the river Elbe at the gates to the city. We got to experience an exciting insight into the interior structure and final assembly of the A320 family and the double-deck A380 wide-body aircraft which is customized there. The total assembly process for an A380 lasts about eight months, half of this being carried out in Toulouse France (assembly and testing) and half in Hamburg Germany (cabin fitting and paint). The tour was 2.5 hours long but felt shorter as the time flew by! It was absolutely fantastic and brought a lot of the class theory on materials, quality and design to life. While in Hamburg, students explored the city and also got to visit attractions such as the Miniature Wunderland, St. Pauli Elbtunnel and the U-Boat Submarine. The total cost for each student was €155 which was extremely good value. This would not have been possible without the generous sponsorship from Diarmaid Boland of Wexford Car Centre, Engineers Ireland, Engineers Ireland South East Division and the Department of Engineering Technology at WIT. Thank you for your continued support. Nigel says he would recommend anyone studying Engineering in WIT to take part in future college trips as it gives the students great hands on experience.